Photo by Scott Bauer, courtesy of USDA. 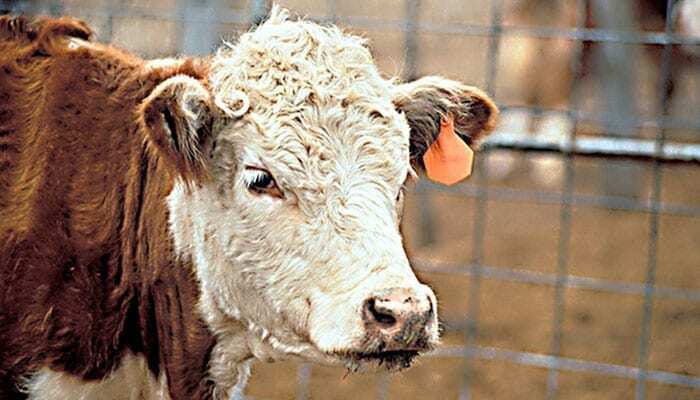 USDA Animal and Plant Health Inspection Service’s (APHIS) National Veterinary Services Laboratories (NVSL) have determined that this cow was positive for atypical (L-type) BSE. The animal was showing clinical signs and was found through routine surveillance at an Alabama livestock market. APHIS and Alabama veterinary officials are gathering more information on the case. BSE is not contagious and exists in two types – classical and atypical. Classical BSE is the form that occurred primarily in the United Kingdom, beginning in the late 1980’s, and it has been linked to variant Creutzfeldt-Jakob disease (vCJD) in people. The primary source of infection for classical BSE is feed contaminated with the infectious prion agent, such as meat-and-bone meal containing protein derived from rendered infected cattle. Regulations from the Food and Drug Administration (FDA) have prohibited the inclusion of mammalian protein in feed for cattle and other ruminants since 1997 and have also prohibited high risk tissue materials in all animal feed since 2009. Atypical BSE is different, and it generally occurs in older cattle, usually 8 years of age or greater. It seems to arise rarely and spontaneously in all cattle populations. The World Organization for Animal Health (OIE) has recognized the United States as negligible risk for BSE. As noted in the OIE guidelines for determining this status, atypical BSE cases do not impact official BSE risk status recognition as this form of the disease is believed to occur spontaneously in all cattle populations at a very low rate. Therefore, this finding of an atypical case will not change the negligible risk status of the United States, and should not lead to any trade issues. The United States has a longstanding system of interlocking safeguards against BSE that protects public and animal health in the United States, the most important of which is the removal of specified risk materials – or the parts of an animal that would contain BSE should an animal have the disease – from all animals presented for slaughter. The second safeguard is a strong feed ban that protects cattle from the disease. Another important component of our system – which led to this detection – is our ongoing BSE surveillance program that allows USDA to detect the disease if it exists at very low levels in the U.S. cattle population. Source: USDA press release, adapted.